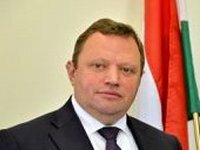 Hungarian Ambassador to Ukraine Erno Keskeny has announced the opening of a new border checkpoint between Ukraine and Hungary in the spring of 2018. "We hope that we will be able to develop border checkpoints and open several new ones in the near future. "Nadgodosh - Velyka Palad", which we hope to open in the spring of next year, is scheduled for the near future," the diplomat said at a roundtable entitled 'Hungarian factor in the domestic policy of Ukraine" in Kyiv on Tuesday. He also noted the importance of the development of the border infrastructure along with the receipt by Ukraine of a visa-free regime with the European Union. "Tourism, travel between our countries is growing and there is an increasing flow of people on the border. Unfortunately, conditions are not good," Keskeny said. The village of Velyka Palad is located in the Vinohradivsky region of the Zakarpattia region. It is situated at the distance of four km from the place of convergence of the borders of Ukraine, Hungary and Romania and seven km from the highway M26 leading to the checkpoint Diakove - Halmeu on the Ukrainian-Romanian border. According to the State Border Guard Service of Ukraine, currently there are three international checkpoints at the border of Ukraine and Hungary: Chop (Tysa) - Zahony, Luzhanka-Beregsurany and Vylok-Tiszabecs.